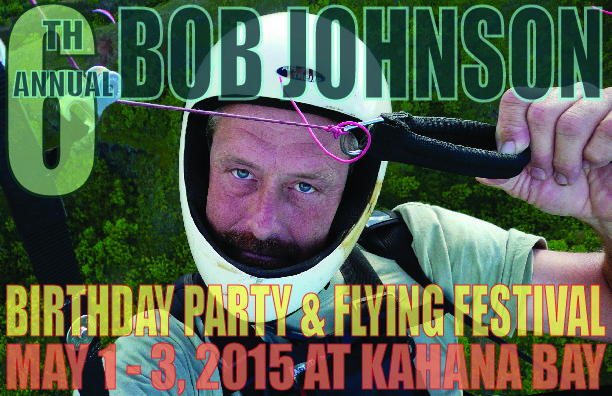 Please join us for the sixth annual Bob Johnson Birthday Party and Flying Festival, at Kahana Bay, from May 1 to May 3. We will be camping and flying and celebrating all weekend long. Everyone is welcome: family, friends, visiting pilots. More details coming soon. This year we will be doing it a bit differently.... we are not planing on having the big kitchen and services that Ces and Mike 5-0 generously have been providing over the years. Instead we will encourage people to bring their own food, supplies and some to share if so inclined, but no one should expect to find food available if they don't bring their own. I will have my charcoal grill available and I am willing to share it. My goal is to get started on thursday (april 30th, weather and work permitting) and be ready to help everybody else coming on friday set up their tents and campgrounds. Don't forget to reserve your favorite campsite 30 days before the flying festival. Hot water shower and sink will be present. Where do you guys reserve the camp spot. I don't want to miss this opportunity to see you all :) Lets fly some circles! Thanks Igor! We got enough spots for everyone, so bring your wing, tent, some grub, libations of your choice and join us! the camping permit night was a success! we secured spots 1 thru 6. besides the spot for the big tent, it is all game: just come and pitch your tent anywhere! it is going to be full moon. Fun Fun Fun! we got Sandy #1, Duck #2, Me (Ray) #3, Kevin#4, Sidehill #5 and Ernie #6. Great job everybody! Wish I could have played the blip blip game with you guys this year but I have been severely afflicted by an intestinal virus. You definitely don't want the details. I was catching some desperately needed feverish sleep when the game was afoot. But it was fun to read the posts after the fact. I'm feeling a little better today, definitely out of the woods, eating some solid food and drinking coffee. Yay! Looking forward to Bob's birthday celebration! Would love to join in on the festivities. So far I haven't missed a Bobfest yet. This year however I'm at the mercy of whoever would so graciously offer to give me (and my gear) a ride to and from the campsite as I'm getting around by bus this year. I live in Kalihi Valley and can be ready to go by 9:00am on the Friday. My # is 227 4010. Please disregard my last comment. My Para-interested neighbor wants to join us there so my ride is covered both ways.